Download Encoding Decoding Free 2019 setup installer 64 bit and 32 bit latest version free for windows 10, Windows 7 and Windows 8.1. The program is completely free, easy, fast and powerful. It is the best way to encode and decode any type of file, which also integrates seamlessly into Windows Explorer. 2017-11-08 (5182). Malware Test (5182): 100% Safe Tested & Virus/Malware Free. Virus free, checked and Ok. Program Protector is unique, state of art security utility that allows you to password protect programs. You can password protect any Windows application. Program Protector is very easy to use and does not require any special computer knowledge. It creates a secure, password protected, virtual disk on your computer. No one without the password can access it or even see the files inside. Utility to control all programs which run on OS Windows startup: you can disable unwanted software, or find more about software which you have installed. You can disable unwanted system processes to get maximum performance of your computer. Comodo Unite allows users to easily group multiple computers into a secure, peer-to-peer network over the Internet. Access your PC remotely, share files, printers, and music, even set up multi-player gaming sessions. The program is completely free, easy, fast and powerful. It is the best way to encode and decode any type of file, which also integrates seamlessly into Windows Explorer. Be used to hide all the sensitive data and important that we want to keep away from prying eyes. Inability of systems to be cracked by ‘Brute Force’ (if the password is wrong does not display the classic error message intercepted by the crackers, but it is decoded in the wrong way the file will appear illegible). Please note that – Be careful not to forget the password, otherwise we will not be able to decode the encrypted files once! 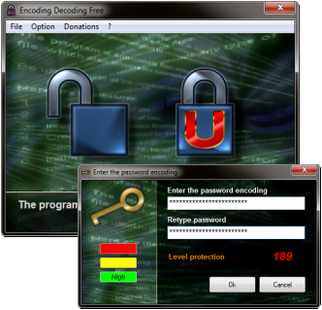 Encoding Decoding Free free to download. Encoding Decoding Free 2019 latest version. 64 bit and 32 bit Support. Encoding Decoding Free for Windows 10, 7 and other prevoius windows versions. How to uninstall (remove) Encoding Decoding Free Completely? Softati.com - does not store Encoding Decoding Free patchs, serial numbers, activation, cracks, license key, keygen or any forbidden files that may cause harm to the original developer. Only free direct download for the original developer distributable setup files. Encoding Decoding Free is developed and maintained by Elefant Software, Softati.com is not affiliated with this software developers by any means. All trademarks, registered trademarks, product names and company names or logos mentioned herein are the property of their respective owners. © 2016 - 2019 – Softati. Disclaimer: All logos, creative works and trademarks are copyright and property of their owners. Microsoft & Windows 10 are trademarks of of Microsoft Corporation.